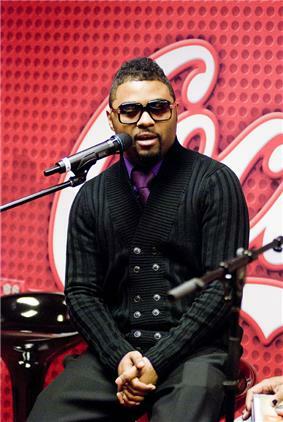 Musiq Soulchild at WGCI radio Coca Cola Lounge in Chicago, 2009. Musiq Soulchild or Musiq (; born Taalib Johnson; September 16, 1977) is an American singer and songwriter whose style blends funk, alternative rock, blues, jazz, some gospel influences and hip hop. Musiq was born in Philadelphia, Pennsylvania, grew up in a strict Muslim household and is the oldest of nine children. At an early age, Musiq left home and dropped out of school at the age of 17. It was during that time Musiq started to build a reputation for being musically gifted, beat boxing for MC's, free styling on the open mic circuit, scatting at a jazz club, or just performing a cappella in the streets of Philadelphia, which is where he got the name "Musiq" and later added "Soulchild", which is intended to respect and represent the legacy and traditions of past soul artists. He cites as his inspiration such icons as Stevie Wonder, James Brown, Patti LaBelle, Billie Holiday, Sly & the Family Stone and Ray Charles. Musiq Soulchild has had 2 platinum albums, 2 gold albums and 7 hit singles. He has received awards from Billboard, BET, ASCAP, BMI, and Soul Train. He has also earned award nominations from MTV, the American Music Awards, the NAACP, and 11 Grammy nominations, including 3 for his 2007 album Luvanmusiq. "There were people who knew of me but they didn't really know me; they just knew me as 'that music dude.' So after getting that so much, I was like 'Just call me Musiq.' It was so fresh to me because if I had to be called anything, I would have wanted to be called Music. That's how much I dug it; when you see me, I want you to automatically think of music." The nickname Soulchild came from two ideas. Musiq quotes it as, "Musiq Soulchild is technically two ideas. 'Musiq' is the front man and 'Soulchild' is the idea behind it. It's basically me as an artist in this generation, representing the traditions and the legacies of the past soul stars." Musiq Soulchild released his debut album, Aijuswanaseing, in 2000. Its lead single was "Just Friends (Sunny)". Musiq's second single "Love" spent 22 weeks on the Billboard Hot 100 charts. Musiq's second album, 2002's Juslisen, debuted at number 1 on the Billboard 200 and went platinum. The singles were "Halfcrazy" and "Dontchange". In 2003, Musiq released his third album, Soulstar. It included the singles "Forthenight" and "Whoknows". Musiq took a four-year break and changed his management to Solqi Management, as well as his record label from Def Soul to Atlantic Records. In March 2007, Musiq's released his fourth album Luvanmusiq. Its singles were "B.U.D.D.Y. ", "Teachme", and "Makeyouhappy". He has also been featured in television and print ads for McDonald's, Nike, Inc., Coca-Cola, Levi Strauss & Co. and The Gap. He made a special appearance on The CW's #1 comedy The Game on Monday, October 29, 2007, as well as the UPN sitcom All of Us. On June 25, 2012, Musiq released a book on love and relationships titled "143 - Love According To Musiq". His fifth album OnMyRadio was released on December 2, 2008. The lead single "Radio" was a complete contrast to the usual smooth neo soul Musiq fans were accustomed to. The following singles were the duet IfULeave featuring Mary J. Blige; and the ballad SoBeautiful. "SoBeautiful" marked the first collaboration between Musiq and the producer JR Hutson, after Hutson had spent "about eight months" trying to get Musiq to come by his studio. According to Hutson, the two plan to work together again. In May 2010, he changed management to Victor Grieg. " His latest album Musiqinthemajiq was released on May 3, 2011, available on CDs and also as a digital download. The first single was "Anything" featuring Swizz Beatz, followed by "Yes". In September 2013 he released a duet album with Syleena Johnson entitled 9ine. This album was a compilation of nine reggae songs recorded in nine days. Also in September 2013, Musiq Soulchild announced his departure from Atlantic Records and becoming an independent artist. He revealed he is now signed to record producer Warryn Campbell's label My Block Records. Musiq previously worked with Campbell on his first two albums on Atlantic - 2007's Luvanmusiq and 2008's OnMyRadio. Musiq Soulchild has featured on "Nothing at All" from Carlos Santana's album, Shaman. He has also made guest appearances on rapper Lloyd Banks's album Rotten Apple, Skillz's I Ain't Mad No More, Talib Kweli's Eardrum, The Roots's Phrenology, Black Ice's The Death of Willie Lynch. He performed "Reasons" on the tribute album Interpretations: Celebrating the Music of Earth, Wind & Fire and "Are You Experienced?" on Power of Soul: A Tribute to Jimi Hendrix. Soulchild has also appeared on the soundtrack to Tyler Perry's movie Daddy's Little Girls and performed with Ice Cube on his 2008 album, Raw Footage. He also lent a song from his latest album Luvanmusiq to the soundtrack for Perry's later movie Why Did I Get Married?. He then recorded a remake of Arrested Development's song "People Everyday" with British rapper and singer Estelle for the soundtrack to Tyler Perry's Meet the Browns entitled "People Everyday (Metamorphosis Mix)". He dated singer Kameelah Williams (of 702) in 2009. They welcomed the birth of their son on March 30, 2009. She is the inspiration for his song "SoBeautiful". The musician is almost always seen wearing sunglasses. One of his eyes is not normally positioned, possibly deemed exotropia. He admitted in an interview that at the age of two his uncle accidentally stabbed his eye with a fork. He has received awards from Billboard, BET, the American Society of Composers, Authors and Publishers, BMI, and Soul Train. Musiq has also been nominated for awards by MTV, The American Music Awards, the NAACP, and has had 11 Grammy nominations. ^ a b c "Interview With JR Hutson". ^ "YKIGS Live: Musiq Soulchild Talks Signing with Warryn Campbell, Supporting Meelah on R&B Divas, Contributing to All Genres". youknowigotsoul.com. You Know I Got Soul. Retrieved 2014-09-14. ^ Rucker, Jermaine. "Warryn Campbell signs Musiq Soulchild to My Block Inc.". gospelbreak.com. Gospel Break. Retrieved 2014-09-14. ^ Murray, Jawn. "New Musiq: Soulchild signs with Warryn Campbell". alwaysalist.com. Always A List. Retrieved 2014-09-14. ^ "Musiq Soulchild Album & Song Chart History - Billboard 200". Billboard. Retrieved February 13, 2011. ^ "Musiq Soulchild Album & Song Chart History - R&B/Hip-Hop Albums". Billboard. Retrieved February 13, 2011. ^ certified awards"Aijuswanaseing"RIAA - Gold & Platinum - February 13, 2011: . ^ certified awards"Juslisen"RIAA - Gold & Platinum - February 13, 2011: . ^ certified awards"Soulstar"RIAA - Gold & Platinum - February 13, 2011: . ^ certified awards"Luvanmusiq"RIAA - Gold & Platinum - February 13, 2011: .